Newly crowned Australian U20 Shot Put Champion, Jaidyn Busch of Christchurch Girls' High School. Photo: CGHS/supplied. 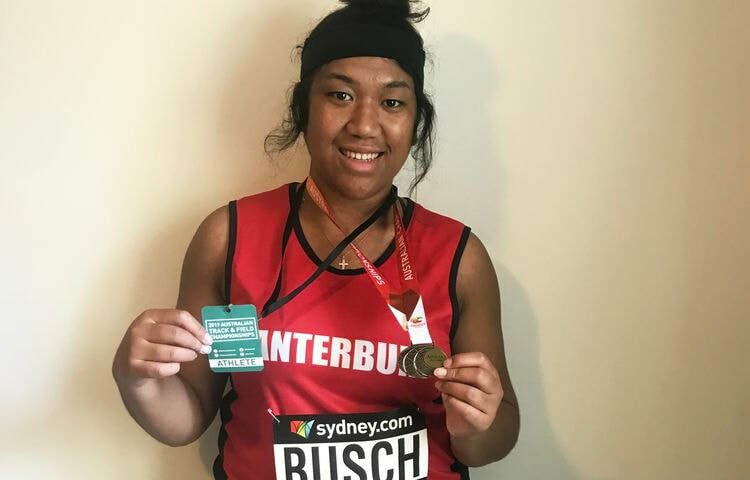 A greater focus when competing and the strong support of family and coaches is paying dividends for Christchurch Girls’ High School’s NZSS shot put champion Jaidyn Busch. “A lot of the time I compete I get nervous and don’t really warm-up properly but in both the South Islands and then in Australia I thought to just give it my all and not care about what others do,” explains Jaidyn. The two recent meets she is referring to above are the South Island Secondary School (SISS) Track and Field Championships and the Australian Athletics Championships, where she recently had two record breaking wins to end the athletics season. The first was in Nelson where she not only won the SISS Senior Girls Shot Put title, she broke the meet record and set a personal best. At the SISS championships she threw the 3.00kg shot put 16.21m. The second event was last week at Olympic Park in Sydney where she was crowned Australian U20 Women’s Shot Put champion. Moving up to the senior 4.00kg weight, she threw a new personal best of 14.38m – throwing that with her first throw and also throwing over 14.13m with her second throw. Her previous PB with the heavier weight was 13.42m, so a huge improvement. “I didn’t know who I was up against and didn’t expect a place – I just went over to Australia with the mindset that this will be a great experience and to just give it my best," Jaidyn says. Her coaches in Canterbury are Amanda Murphy, who is also a former Canterbury and Black Ferns rugby player, and Dale Stevenson who is also senior male star Tom Walsh’s coach. Shot put is her sole focus, although she wants to start hammer next year as well. ​Now that the athletics season is over, what is coming up for Jaidyn? Jaidyn plays No. 8 for the Christchurch Girls’ High School rugby team and for Christchurch club side High School Old Boys. She says that training for both sports has many similarities so, assuming she doesn’t get injured playing rugby, the benefits are mutual. She is from Hinds in Ashburton, but lives with her step-grandparents in Christchurch and attends Girls’ High. 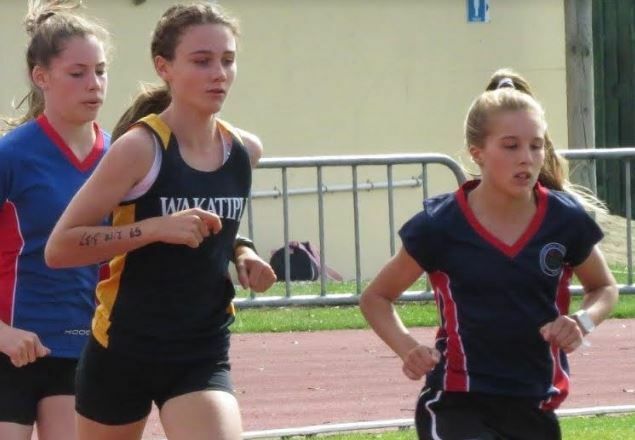 Prior to her recent SISS and Australian successes, Jaidyn was busy competing in the several athletics meets around New Zealand this season, including the New Zealand Track and Field Championships and the Big Shot event in Canterbury earlier this year. At the NZ Track and Field Championships held in Christchurch from 8-10 March, Jaidyn finished fourth overall in the Senior Women’s Shot Put and second in the U20 Women’s Shot Put, behind winner Kaia Tupu-South of Westlake Girls’ High School. At the end of the year in Wellington Jaidyn will be defending her New Zealand Secondary School’s Senior Girls Shot Put title, which she won in Dunedin last year by throwing 16.00m in a big effort at the end of a hard-fought competition. She will have strong competition in Wellington in December, such as from her friend Amania Mafi from Upper Hutt College and recent winner of the NISS Senior Girls Shot Put, Kaia Tupu-South, who is just year 12, and Canterbury squad member Tapenisa Havea from St Andrew’s College who is also a hurdler and sprinter. In December 2017, Jaidyn finished second at the NZSS Championships in Hastings behind Lynfield College’s Madison Wesche, who set a new meet record of 17.03m with her first throw. Also on Jaidyn’s radar is the 2020 World Youth Olympics in Kenya maybe the Commonwealth and Olympic Games one day. But for now, she is taking a well-earned short break before climbing into off-season athletics training and rugby and studying for her NCEA Level 3 exams at the end of the school year. Kennedy Taylor leading eventual winner Samantha Fookes in the U14 Girls 1,500m. Both Samantha and Kennedy went under the 1,500m record. PHOTO: Southland Secondary School Sport. Back in 2006 Christina Taylor set an U14 Girls 3000m record in the Southland Secondary School Track and Field Championships. Christina went on to capture every other grade championship record in the U15, U16 and Senior grades. Along the way she also collected New Zealand championship and NZSS medals on the road, track 3000m and steeplechase. Given her background, it is not surprising the U14 record survived 13 years. Until this year. What was surprising was the margin by which the record was broken at last Friday’s Southland school championships – nearly half a minute. To be precise, 28 seconds was taken off a record originally set by someone who went on the win national championships and represent New Zealand. And the new record holder? Another Taylor, this one 13 year old Kennedy. While no relation Kennedy attends the same school (Southland Girls’ High School) and has the same coach as her namesake. The diminitive, slight 13 year old is a small version of the energiser battery, always on the go. As well as setting running records she was in the Basketball Southland U15 development squad, a touch player, swimmer, competitive cyclist and triathlon champion. While lopping 28 seconds off the secondary schools record, running a fraction over 11 mins, Kennedy has run faster, with a 10.49 late last year to her name. She will be competing in the New Zealand Secondary Schools Triathlon Championships in New Plymouth next Friday and Saturday during Summer Tournament Week. Last year she won the U13 girls section at the national championships. Her older brothers (Jaxon and Josh) are also prominent in athletics and triathlons. There is no doubt the remaining Southland Secondary School 3000m records will be held by a Taylor. But which one? Will it simply be a matter of the records keeper changing the initials? Time will tell. Another leading performer at the recent South Island Track and Field Championships in Invercargill was Samantha Fookes from Wakatipu High School. Fookes broke the U14 Girls 800m and 1500m records .The old 800m record was 2.26.53 and Fookes ran 2.20.54, and the old 1500m record was 5.08.67 (set 19 years ago) and her new record time was 5.02.17. Of note, the U14 Boys 800m, 1500m and 3000m races were all won by the same athlete – Ethan Friend from St Peter’s College, Gore. Another Wakatipu High School athlete, Hayato Yoneto broke the Senior Boys 100m record (10.97s) and looked like he could have broken the 200m but slowed down (winning time 23.49) to conserve energy for the Wakatipu HS 4 x 400m relay team that broke a 20-year old record. The record had been 3.41.81 and they ran 3.36.20. Southland Girls’ High School’s Dannika Collins-Wilmshur won the Senior Girls 100m in 13.10s and the Senior Girls 200m in 26.74s (+3.7 wind). Many of the leading athletes will now head to Saxton Oval, Nelson from 29-31 March for the SISS Athletics Championships, ahead of the NZSS Championships in Wellington at the start of December. The 96th annual McEvedy Shield athletics competition will be staged at Newtown Park, Wellington on Tuesday. Wellington College, St. Patrick’s College, Wellington, St. Patrick’s College, Silverstream and Rongotai College are the fierce annual combatants. The McEvedy Shield features four age groups, U14, U15, U16 and Open. Ten track disciplines and six field events are held. Points are rewarded on a 4-1 basis for every event with the winner receiving four points. Can anyone stop Wellington College from a five-peat in 2019? Wellington’s record for most wins on the trot is five between 1993 and 1997. The record for most consecutive wins at the McEvedy Shield is six by Silverstream between 1968 and 1973. The final scoreboard in 2017 - a new record. Has won the Shield a record 52 times. The sheer size of the school role, nearly double that of the other schools, is a significant advantage. Last year Wellington College won by 38 points which isn’t anywhere near as convincing as their 90-point romp in 2017. Does this suggest Wellington College is on the wane? Wellington College had another successful New Zealand Secondary Schools Champs in December winning eight medals across a range of events. One of those medals was a Silver in the junior discus by Max Abbot. He will hard to beat in the U16 discus although team mate Caleb Stanley could very well. Year 9 student Fiti Aliva finds himself in multiple events in the U14 grade. However it will be the hurdles and discus where he will most likely prosper. Jamie Kearns has a busy day ahead of him in the U15 grade competing in all three jumps again. He has had great success recently, breaking the Wellington College U15 long jump record. He’s also running the 200m and is a member of the relay team. Joshua Williams will be hoping for his fourth consecutive 100m victory at McEvedy, this year running in the U16 grade. Last year he ran 10.98 seconds which would have smashed the current U15 electronic record of 11.30 seconds. If Lachlan Bruce can win in the U16 400m and 800m, it would be his third year in a row achieving this feat. Wellington College won 26 of 55 events in the McEvedy last year. St Pat's Town and the smurf army. Town has won the Shield five times in the last 11 years and 20 times overall. Town won the recent Old Boys Cup against Silverstream by 86 points, four-times the margin they achieved in 2018. Town was consistent across the board winning 20/33 track events and 20/30 field events. Town won all five relays. Isaac Oliver and Fereti Ahanu-Brown are co-captains and the former is the current record holder in the senior 100m (10.94) and 200m (22.31). He is also the current title holder of the senior 400m. At the New Zealand Secondary School Championships Isaac gained a Bronze medal in the senior boys 200m (22.91sec) and came 6th in the 100m (11.31sec). Ahanu-Brown, a talented rugby player, will represent Town in the Senior triple jump. On the subject of jumping, William Georgeson shares the McEvedy record of 1.88m in the U16 High Jump and was sixth in the senior division at Nationals last year leaping 1.90m. Mark Tyrell made headlines in the U14 age group at the Old Boys Cup winning the 100/200m double as well as the long jump, shot put and discus. On Tuesday he will be competing in six events – 100m 200m, high jump, long jump, discus and shot put. Hasn’t won the Shield since 2003 and that’s unlikely to change after a poor showing at the Old Boys Cup. Silverstream was beaten by more than 70 points at Old Boys last week, despite winning 15 events at McEvedy last year - more than Town. Tellingly Silverstream lack depth in the senior age group winning just five of 25 events. Ollie Krijnen, winner of four events at last year’s McEvedy, is absent with a fracture in his lower back. Sautia Misa was responsible for nearly a quarter of Silverstream’s victories at Old Boys finishing first in the U16 100m and 200m as well as striding clear in the hurdles, long jump and triple jump. Misa broke the U15 high jump and long jump records at McEvedy 2018 and looks certain for further acclaim a year on. Thomas Strawbridge and Logan Stoupe are two middle distance runners who’ve shown vast improvement in the last 12 months while Hamish Lock in the open hurdles was a silver medalist at Nationals in December. Silverstream have won the Shield 14 times overall and in veteran coach Hugh Steel boast one of the genuine legends of Wellington Secondary School athletics. Rongotai College holds the record for the largest victory ever in 1989 and has won the Shield seven times overall. Disturbingly, Rongotai didn’t win a single event last year. Will things improve in 2019? Rongotai are unlikely winners, but they have some athletes with pedigree and promise. Jaylin To’o is a New Zealand U17 Basketball rep who personifies power. He is the younger brother of Denny To’o who won multiple field events at McEvedy for Rongotai. Jaylin will feature in shot put and discus. Bevan Cox fought hard to finish third in both the U15 800m and 1500m at McEvedy 2018. A talented middle distance runner with a lovely running style, he should compete strongly in both. Pose Tuilaepa is a recent arrival from Samoa joining family here. His stature and athletic prowess are striking. Tuilaepa impressed at the Rongotai Athletics day and has entered the open 200m, 400m, relay and 110m hurdles. Full concentration for Maddie Wilson at December's NZSS Championships in Dunedin. PHOTO: Caswell Images - www.caswellimages.com. The future is wide open for newly crowned New Zealand U18 Heptathlon champion Maddie Wilson. In her first attempt at the seven-event heptathlon at the New Zealand Combined Events Championships in Christchurch this past weekend, Maddie not only won the national U18 title, she came up just 91 points shy of qualifying for the Oceania Age Group Championships later this year in Townsville. The year 13 Gisborne Girls’ High School head girl won with 4709 points, and she heads to Sydney in April for the Australian U20 Nationals with the mark of 4800 points in her sights. The heptathlon consists of the 100m hurdles, High Jump, Shot Put, 200m, Long Jump, Javelin and 800m run and points are awarded in each event and totaled up at the end for the winning score. Considering her limited experience competing in some of the events and adversity in training in her home town of Gisborne her prospects are good. “We don’t have a track in Gisborne, which is a really big problem,” says Maddie. “My main event is High Jump, but not having a track means that I can’t practice with a proper run up for both High jump and Long Jump. The group either trains on grass at the Awapuni Stadium in Gisborne or on the beach. “Most of us do lifesaving as well as athletics, so we are at home training on the beach,” explains Maddie. Maddie competes for local club Waikanae in sprints and board races, and has medalled in national age-grade surf life saving events too. There are similarities in the two sports and they often complement each other. So how did Maddie get into the combined athletics events? “I have always done well in the high jump and at the New Zealand Secondary School nationals in Hastings at the end of 2017, I defended my Junior Girls High Jump title with a PB of 1.70m. “ I have also given other events a go throughout my childhood at the local club nights and managed to do well at both the throwing and running aspects, so my coach Terry Lomax, who is the Athletics NZ Combined Events lead coach pointed me in the direction of the heptathlon. “At this meet last year I won the U16 Hexathlon, which has one fewer event [no long jump]. That was my first time doing a competitive shot put, javelin and 600m [shorter distance].” At the NZSS Nationals in Dunedin in December she competed in the 200m (finishing eighth), 100m Hurdles (eighth) and High Jump (fifth) in her first year in the senior age group. Following the Dunedin NZSS Nationals she joined the NZ team in Cairns at the Australian Secondary School nationals, finishing sixth in the high jump but she was below her best. Competing in her favoured high jump event in Christchurch this past weekend. PHOTO: Dennis Gin. The Combined Event Nationals featured a field of about 20 athletes competing together in the U18, U20, Senior and Masters grades in the women’s heptathlon. Last year’s U18 winner Kayla Goodwin (Sacred Heart College, Hamilton) won the U20 section with 4745 points and an athlete from Japan, Yuki Yamasaki, won the senior event with 5524 points. How did the weekend pan out for Maddie? Sam MacKinder (Palmerston North Girls’ High School) and Julia Burnham (Villa Maria College) were the second and third placed finishers in the U18 section. Maddie would like to say a big thank you to both her parents and three coaches, Terry Lomax (jumping and combined events), Arna Majstrovic (running) and Cory Hutchings (surf lifesaving) for their all their time, support they give to her. Maddie first came under Lomax’s wing in year 10 when she moved to Christchurch for a year with her family, attending St Margaret’s College. During that year he helped her out with her technique and training, primarily for high jump but also setting the groundwork for other events she is now competing in as part of the heptathlon. As well as her sports, Maddie is also academically minded. Last year she sat and gained a scholarship in Level 3 Scholarship biology, although she was only in Level 2. She is interested in studying health science at Otago University post- school but is leaning towards taking a gap year and moving back to Christchurch to train for athletics to see where that path takes her. The recent Dunedin held National Secondary School Track and Field Championships saw four triple jump gold medals up for grabs. Southland athletes took half of them. Southland continued a proud record in the event and currently holds three of the four championship records: Junior Girls (Jade Graham), Senior, Girls (Atipa Mabonga) and Junior Boys (Sam Colyer). Based on performance to date Quinn Hartley (James Hargest College) was one of the favourites in the Junior Boys competition. Quinn had already won gold in the long jump so motivation and concentration for the triple was in doubt. Junior triple jump winner Quinn Hartley with second placed Brad Spicer of Onewhero Area School and third placed Har Patel-Muxlow of Wellington College. PHOTO: Caswell Images. No need to worry. The first jump put him into second, the third into first, and while improving each jump it was a position he held for the next three rounds. But it was the sixth and final jump where he showed the field what he is made of, upping his already winning leaps from the third, fourth and fifth rounds by an outstanding 60 cm and finishing a notable 70cm ahead of second. For 14 year old Quinn it was an impressive championship with a high jump bronze to go with his long and triple jump golds. Andrew Allan (Gore High School) won the Senior Boys triple previous year, in fact was the only returning gold medalist from a Southland school. As existing champion and highest ranked jumper in the competition Andrew was expected to medal. But he had been had been suffering from injuries that hampered preparation. Again, no need to worry. Andrew’s fighting spirit had him in second from the opening jump. While improving through subsequent rounds he was still second with one jump to go. With the urging of the large crowd clapping in time to his gradually accelerating run-up the 18 year old hit the board perfectly and launched himself skywards. The crowd grew silent as the official measured the distance. Then as a roar as 14.21 went up on the board; a 35cm improvement, a PB and the winning distance. One jumper to go. Andrew, coach and crowd help their breath as Charles Annals from Hamilton Boys’ High School finished the competition with a good 14.16, and the silver medal. Close, but not close enough to edge Andrew out of the gold. More than one person commented that this was the best, most competitive competition of the games. Is it the Southland air or is it in the water? Greer Alsop (SGHS) won in similar circumstances back in 2010, the first of her three consecutive senior triple jumps titles. (Atipa Mabonga, SCC, carried on the tradition, winning three uninterrupted senior titles). Greer also had had her build up restricted by injuries, in fact was unable to even run for five weeks prior to the championships and she too finished first, winning on her very last jump. Olly Parkinson hurdling to gold at the 2018 NZSSA Track and Field Championships. PHOTO: Caswell Images. Olly Parkinson has jumped to National Secondary Schools hurdles titles and played for the New Zealand Under-18 Maori rugby team in the past two years. The Auckland Grammar prefect and athletics captain is a recipient of the Sir Wilson Whineray scholarship which entitles him to $15,000 towards University fees and for playing club rugby for Grammar Tec. Is Parkinson done on the track? “It’s a huge privilege to get the Whineray scholarship. I’m one of two recipients along with my friend Corey Evans. I’m still going to do both sports. I’m in the Pathway to Podium program for hurdles and rugby’s gone well,” Parkinson enthuses. At the National Secondary Schools athletics championships in Dunedin last weekend, Parkinson successfully defended his 110m hurdles title. The conditions were tricky at the Caledonian Ground. “It was really windy which makes it hard to build up your stride before each hurdle. I ran 14.65 which is a little bit slow, but I was happy to win again,” Parkinson reflects. Parkinson’s PB is 14.15 achieved at the equivalent meeting in Hastings last year. Hamish Lock from St Patrick’s College, Silverstream was second - a position Parkinson had to settle for in the 300m hurdles behind Mattheus Pio from St Paul’s Collegiate. “I was second last year so I was disappointed to finish second again, but it was a pretty good weekend,” Parkinson said. In addition to the hurdles Parkinson ran the last leg in Grammar’s 4x100m and 4x400m relay successes. In the shorter event Parkinson was joined by Dominic Overend, Jamie Chambers-Steward and Liam Wong. The 400m relay team comprised of Ben Kelsey, Wynton Richards and Finn Ward. Parkinson is the captain of athletics at Grammar and the sport is a natural fit with his family enjoying a long history of involvement. His grandfather and father were nationally ranked athletes and Olly is coach by Joe Hunter, the New Zealand High Performance hurdles coach. “I’ve being working with Joe for a couple of years. I had another coach before Joe who knew Joe. When Joe said he wanted to work with me we both agreed to a swap. I’m grateful for Joe’s expertise and passion,” Parkinson acclaims. In rugby Parkinson’s speed made him an obvious fit on the wing, but it wasn’t until he switched to flanker things started to happen. “I went to an Under-16 Central tournament and Matt Atiga moved me. I was a bit surprised, but after the switch I kept making rep teams so I stayed there,” Parkinson reflects. Parkinson has been a member of the Auckland Grammar First XV for the past two years. In 2018 Grammar finished fifth, narrowly missing the semi-finals. “That was disappointing. We had an awesome forward pack and dominated most teams up front, but we were inexperienced and a few things went against us,” Parkinson rues. Parkinson was excluded from the New Zealand Schools and Barbarians squads gaining a representative lifeline in the New Zealand Maori which he conceded was initially difficult. The novel messages worked a treat. The Maori stunned the Barbarians 21-20 with Parkinson crossing the stripe for a try and then foiled a fast finishing Fiji 20-15. The Maori weren’t necessarily expected to win either game. “I think the bond we created was a big part of our success. Our Maori culture is something we only share in common. We were all disappointed not to take the Schools and Barbarians so we all felt we all had something to prove,” Parkinson observers. Parkinson has studied Maths, English and Geography and Business in class this year and will pursue the latter at AUT next year. Note: Auckland Grammar enjoyed a successful meeting at the New Zealand Secondary Schools athletics championships. In addition to Parkinson’s triumphs other highlights included Dominic Overend winning the 100m/200m sprint double while Year 11 student Michael Percival-Afeaki struck gold in the 100m, 200m, Long Jump, Shot Put and Javelin in the para-athletics competition.